Once you have started with Markdown it is likely that you will come to a point where it is indispensable. 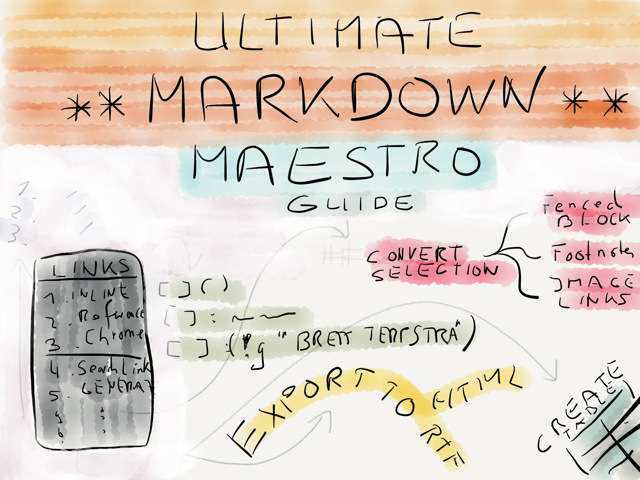 What you want is Markdown everywhere. If you’re in the browser typing an email to a fellow geek or in an editor with which has no out of the box Markdown support. At least this is my experience when I look back at my Markdown quest so far. Like so often Keyboard Maestro was the best way to tackle the task for me to unify the mass of scripts and services that are floating in the endless space of the internet. I have a lot of Keyboard Maestro macros and a good deal of them is there for editing text, which means for me: editing Markdown. I called this the “Ultimate Markdown Maestro” because for me Keyboard Maestro is the absolute best way to write and tweak Markdown, no matter which editor I’m in. This article is about how I organize my macro library and what tools I use for writing Markdown. In short: four macro palettes and one group to rule them all. I want everybody who is willing to write in Markdown and has no idea how to make use of Keyboard Maestro to get inspired and give them some ideas how to use the program. For that purpose I uploaded my whole Markdown setup to GitHub. And for the die-hard geeks I hope there is the one or other thing for you in it too. If this is more than you need you can trim it down till your requirements are met. If you’re already sold then read on before your head on to download everything because there are a lot of dependencies: services to be installed, scripts to put in the right location, etc. Rest assured, I’ll explain everything in detail. At the bottom of this article you’ll find a link list with all referred scripts and services for your convenience. Get rid of macros I don’t use or those that actually don’t work for me. Fine tune my palettes so that I can get a better idea of what is going on in each palette even if I haven’t visited the palette in question for some time. A quick way for identifying who made a macro and what its purpose is. Have a more maintainable system which is also easier to share. So far I’m happy with my spring cleaning and I think you’ll benefit from it too. TXT: Markdown is where standard Markdown operations like bold, italic and making lists live. I don’t need a palette because what I want here is fast access to the basics. 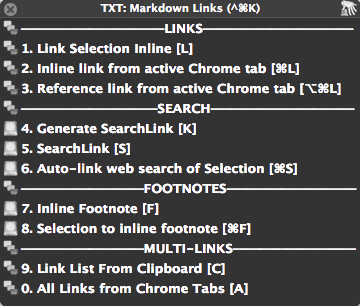 TXT: Markdown Links is a specialist for links creation. TXT: Global is a mixed palette which contains Markdown and text macros that aren’t needed all the time, but that provide power users an array of options to choose from like creating footnotes, tables and fenced code blocks. Also in the bag are standard text operations like wrapping, transforming text, etc. 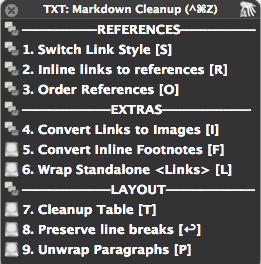 TXT: Markdown Clean Up waits for you when you have finished writing and are in need to bring order into the mess. 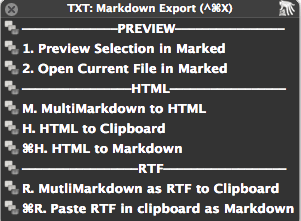 TXT: Markdown Export offers you a variety of export options. What I mean with modular is that I only use Execute Macro actions in Keyboard Maestro to structure the everything. In case you never used a “execute macro” action, it is the equivalent to an alias in the Finder. The macros of the top section stay where they are and anywhere I need them I call them up by executing the macro. Nice and clean. 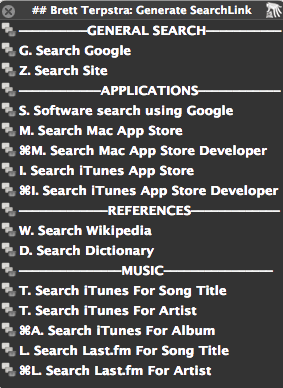 I tend to over use unicode characters1 to sort my iTunes Library before there where folders in iTunes. I’ve learned from my failures and kept it to a minimum here. The reason behind this is that I wanted my text expansion groups to be position right before the bottom section. Unicode characters follow an alphabetical hierarchy and that makes them qualified candidates for sorting stuff or forcing a hierarchy upon files where only alphabetical sorting is allowed. For example: » comes before ❯ comes before# comes before 123 comes before ABC comes before . This is basic file management. Everybody does it in the Finder to some extend and so I guess most of you probably have setup a similar system for Keyboard Maestro to cope with their library. You know have a rough idea of my preferred order. I will now go into detail why I think it’s a good idea to create such a top section. In the screen shot below you see everything that you’ll have to import into your Library (highlighted in blue). The folders at the top which have a ## prefix are the first part of the dependencies. These are collections from other authors and myself. To keep your Keyboard Maestro library from gaining too much weight, the GitHub download only includes macros necessary for the Markdown setup which Im going to introduce to you here. I added a read me file at the top of each group where you can find the original source and a link to their blog2 – all these people are dear to my heart, because over the last years they have contributed to the Mac community by sharing their thoughts, ideas and last but not least fabulous scripts, macros and services. The idea behind this is, that you can check for updates of scripts and services directly at the source without having to search the web for who did what. Also you know every time who to give props to when you build something based on someones work. It’s a reference and safety net. By setting the menu title in the second action to APPLICATION, I make sure that Keyboard Maestro knows the service can be triggered from any application if it’s available. You can leave most of the groups disabled since we access the macros inside via the “Execute Macro” action. Even the macros themselves can stay disabled. 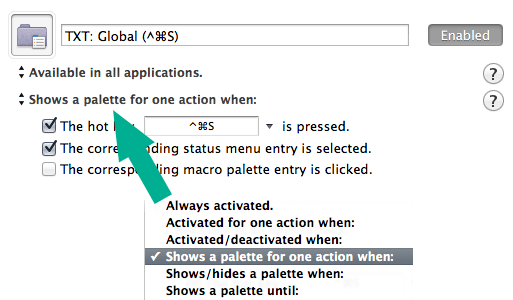 Although, I use this to give me a visual cue which macros I actually use and which are only sitting in my library without being assign to one of my global palettes or applications. You have to install Brett’s Markdown Service Tools and his SearchLink service. And just for your information, that was an order Private – I just can’t let you miss the best things in Markdown, that’s why I put the emphasis there. Pardon me. I couldn’t live my Markdown live as it is without these and that’s why the deserve a) an honorable mention in a separate section and b) I’ve build two macro groups for Brett’s two projects. If you’re still not convinced head over to the example section of the project. The great thing is that Brett’s scripts are always smart – you don’t need to fill out all arguments. Again, read his article to find out what’s optional, how to install SearchLink and get the whole thing running (only one Ruby gem needs be installed). If you’re done, nothing will stand in your way when in need of creating links in an instant . It prompts you for a reference tag and a search text and then generates ready to use snippet respecting the optional arguments. The result can be expanded via the SearchLink macro. Remove all the assigned hotkeys from the TXT: Markdown group. Set a shortcut and begin assigning hot keys. In the example you can see it in action. In OmniFocus and OmniOutliner I don’t want this shortcut to outdent my selected Markdown text, I want the hot key to fulfill its regular duty and outdent my outline or tasks. It gets bypassed and the macro gets canceled. Just add your applications to the conditions list were you know that the shortcut interferes with important hot keys that you don’t want to miss. A very simple macro that I use quite often. It puts the carrot in the middle of the unobtrusive (**) which Brett Terpstra defined as syntax base for his Service for writing inline MultiMarkdown footnotes. The macro creates a Markdown table and prompts you how many columns and rows you want to have in your table. Dependency: You have to download an additional AppleScript from my GitHub and change the path to where you decided to put the file. Update: Thanks to Walton Jones (see comments) for making the external script obsolete. Searches how deep the heading is and adds a # followed by a space sign. Stops after a level 6 heading. I write my headings with a space as divider if you don’t do that the rule will be simpler and faster. In the first if condition add the editors which got this feature build in, c.f. Byword (I love this smart feature that’s why I tried to replicate it). Usage: The macro takes a while since this is GUI scripting… be patient and don’t rapid fire the macro. If you know how to do this with regular expression6 or plain old Shell Commands I’d love to hear about it since this attempt feels more than cumbersome. I bet there’s a better way, e.g. using sed. Links are the meat of Markdown blogging. This is a special palette with an shortcut assigned to it which vaguely resembles the system default create link – instead of ⌘K this palette uses ^⌘K. This is the palette I use the most and I kept it clean on purpose, although there are more operations which could have been included. You might want to beef up this palette to fit your specific needs. You can trigger the macros with the hot key in square brackets or via the number at the beginning. Based on Gabe Weatherhead’s smart Add MD Reference from Safari macro which also grabs the title of a website I was able to change a few lines of code and make it work for Google Chrome. It’s also the base for the inline link version I use. Brett Terpstra got you covered with the “All Links from Safari Tabs”. It’s part of the Markdown Service Tools, just change the description and choose the corresponding Service via “Execute Macro” if Safari is your default browser. Link Selection Inline is part of the Markdown Service Tools and does exactly what it says. If you have a link in the clipboard it makes use of it, otherwise the parenthesis stay empty – I told you Brett writes smart scripts. Speaking of the devil mad scientist, I explained SearchLink in the dedicated Brett Terpstra section of the introduction to this article and why it’s such a cool service. This is the palette from which I generally summon Generate SearchLink, put in the details of my search and continue writing. 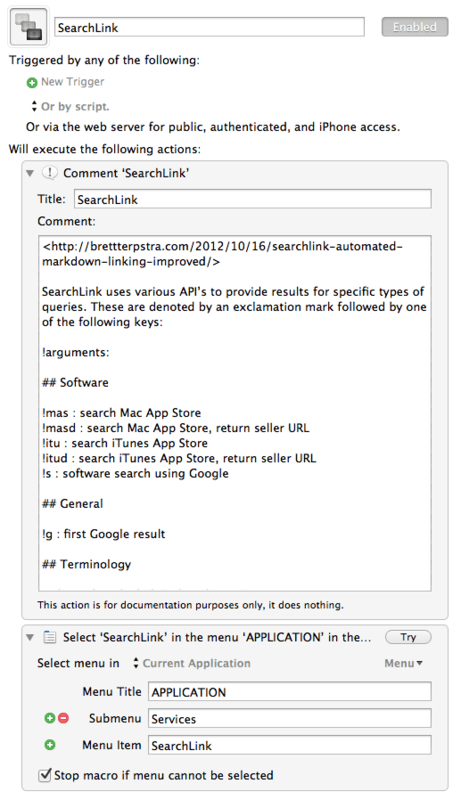 Auto-link web search of Selection is another one from Brett, the predecessor of SearchLink which runs an immediate web search returns the first link it finds and pastes it with an inline link syntax. Inline Footnotes is the same command that I wrote about in the Markdown Basic Set section. Although fn SPACE SPACE is fast to type and easy to remember I felt it would be coherent to pair it with its big sister Selection to inline footnote. Remember you can trigger the macros with the numbers, in this example (7.) and (8. ), or with the assigned hot keys F and ⌘F. For some things I like the versatility even if there’s a good chance that one system usually sticks in the end. This palette has the hot key (^⌘S) assigned to it since most of the macros inside it are useful when you have text selected, hence the “S” in the shortcut. You see some old friends in this palette: The footnotes and SearchLink are also in the Markdown Links palette (^⌘K), but they belong to my favorites. So, at least for me it is convenient to also have them in this palette where the same hot keys are assigned to them (to be precise: at least for the letter hot keys this holds truth, they numbers are slightly shifted). My Create Table macro has also made it into this additional tool belt. It is up to you to trim down this palette to include only what you really need. A MultiMarkdown feature that allows you to render Markdown inside of an HTML block. The Insert Raw HTML Blocks macro prompts you for a class – my most frequent use case – and sets the carrot inside the html block. Macro number two does exactly the same but allows you to select the Markdown you want to wrap upfront. Markdown **inside here** get&apos;s rendered! 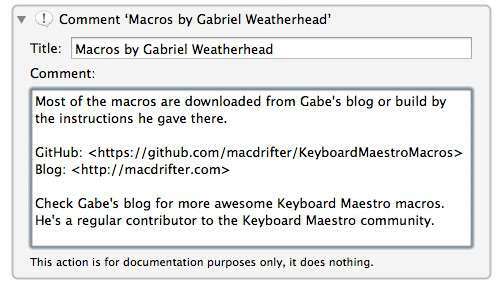 These two macros are once again based on a macro of Gabe Weatherhead – see ## Gabe Weatherhead or read more here and take a look at the other great text processing macros. His Fenced Text macro prompts you to choose between ~, - and #. The only modification I made was to remove the user prompt and set the default to ~ which gives me quick and easy MultiMarkdown fenced code blocks in two flavors: with selection or without. I mentioned it before: Marked is a weapon.7 Having the chance to open a piece of Markdown swiftly in it and take a peek at troublesome or beautiful code is worth having it in this palette – and it can do much more. 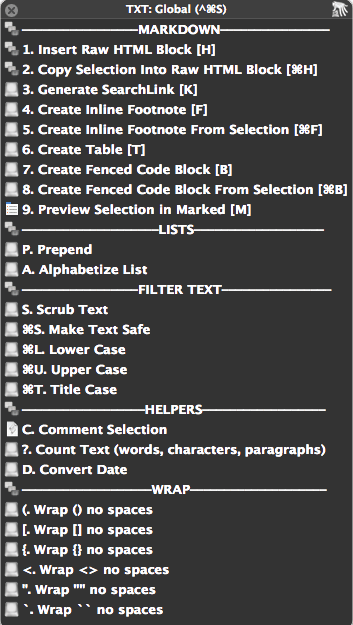 Like the Fenced Text macro, the Prepend and Alphabetize List macros come from Gabe’s post «Text Processing Macros». I need this one more in academic writing than writing blog posts. The Prepend macro is a similar to Brett’s Bullet List macro which defaults to using an asterisks. Gabe’s macro doesn’t recognize the level of indention, but it let’s you choose the prefix. When I’m in nvALT and prepare a list for TaskPaper I fire it up regularly. Matter of fact it’s my default for every list that shouldn’t be an asterisks list, which is often the case when I pass a document to someone who has no clue what Markdown is. I like to have these around. Especially the Wrap macros. I need them every 10 minutes to say the least. Especially when I’m writing class notes in a lecture with Pear Note at the university. Brett’s wrapping services stopped working since the last update – he’s about to fix them and get around the strict Mountain Lion security measurements. For now I use the macros from my German fellow countryman Andreas Zeitler which you might know already from one of his many excellent Mac OS X Screencasts. If you haven’t seen his Keyboard Maestro Github repository you have to check it out. It’s full to the brim with Keyboard Maestro goodies. His blog is also filled with good tweaks and a lot of geekiness. Not exactly Markdown helpers, but I still use them on a regular basis. To briefly describe the Comment Selection macros: when coding they allow me to comment HTML, CSS or script sections. I doubt they are of any use for most Markdown writers. Count Selected Text displays a Growl Notification if grownotify is installed about the amount of words, characters and paragraphs in your selection. -- Registers a new notification in Growl. You can set a unique theme there. -- Set an application icon for the notifications, defaults to TextEdit. register as application "Word Counter" all notifications allNotificationsList default notifications enabledNotificationsList icon of application "TextEdit"
notify with name "Word Count" title "Word Counter" description "
Characters: " & (myCount as text) & "
Words: " & (myWords as text) & "
Paragraphs: " & (myParas as text) application name "Word Counter"
The AppleScript is a bit deprecated since Keyboard Maestro now has this feature build in. A System Service which takes selected text and parses it into a standard date format, using keywords at the beginning to define which format to use. You can also read more about it here in the first of his two posts. This is my second favorite palette because when I’m opening it, this means that I’m almost done with a writing project. The hot key (^⌘Z) is chosen because it is tangent to the other palettes shortcuts. The order of the macros here can be of importance since the References tend to be harmful to your text if you use anything other than standard Markdown. I tried to list the risks in a disclaimer section. However, I take no responsibility for the correctness. If you write in standard Markdown there shouldn’t be a problem using any of the macros. Switch Style is formd by Seth Brown aka @DrBunsen, a style switcher between inline and referenced Markdown links and images. Here’s his GitHub page for the formd project. I love formd, that’s for sure, but there are some things to pay attention to…. Links only wrapped in square brackets won’t work! [Test] fails while [text] is just fine. Reference links with a title attributes like [test]: test.com <http://test.com/> (This is a title) or [test]: test.com <http://test.com/> "This is a title" won’t work. References without a link will get deleted. The good thing is it works splendid with Footnotes. But for those few of you who use MultiMarkdown Citations be aware that it will mess with your text. [#Doe:2006]: John Doe. *Some Big Fancy Book*. Vanity Press, 2006. 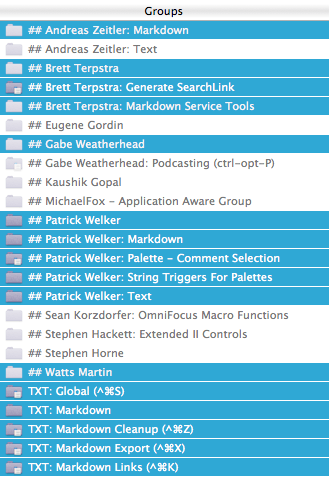 Brett’s version from the Markdown Service tools has similar problems with MultiMarkdown. [test]: test.com <http://test.com/> "This is a title"
When using footnotes or citations → It will delete: [#Doe:2006]: (see example from above). A Script/Service from Phaedra Deepsky which you can download here. Dr. Drang’s Tidying Markdown reference links is a similar script which uses regular expression instead. I wasn’t able to transfer it to a service or use the Python code inside Keyboard Maestro. So I made a wrapper for Phaedra’s Service. What [else] could it [be][question_mark]? What [else] could it [be]? A nice extra is, if a reference is missing like [here] it will put : ***A Missing Link*** in the reference list. The drawback is that the script is still a bit buggy: a reference with no link get’s deleted! Footnotes: the script deletes the whole reference. I usually run one of the reference macros before continuing to the extras section of this palette which takes care of every bit in my document that looks like a link. internet.com—some-image.png <http://internet.com/some-image.png> turns into ! (internet.com—some-image.png) <http://internet.com/some-image.png)>. Gabe Weatherhead took a regular expression from John Gruber and turned it into this nifty macro. Just select all your image urls and let the macro run. I’ve added a prompt for a reference tag since I tend to not batch convert my urls. However, if you do just set Gabe’s version in the execute macro or leave the prompt empty and press enter. The service from Brett to convert inline footnotes is explained in detail in this article on his site. Check out the simple syntax and you are ready to go. The last things I do with a finished piece is first run the Convert Inline Footnotes macro and then the Wrap Standalone Links macro. Both just work and make my life easier. The hot key for this palette is (^⌘X) – X for export made sense to me. In a time before Marked I was looking for a way to convert Markdown to RTF for the occasional clean looking Email. I came across Coyote Tracks - Updated Markdown services by Watts Martin which did just that. I still keep them in this palette along with the options that are included in the Markdown Service Tools and . The recent update to Martin’s services even take care of MultiMarkdown Footnotes and convert them into the RTF. If you don’t have Marked8 and you want to use the service then make sure you’ve followed all the instructions from Martin. You can download the services here. The Keyboard Maestro wrappers are on my GitHub. Some of the scripts who use shell scripts or services might break your text when using FoldingText. I’m a huge fan of this innovative and smart application and would like to use it more, but the results when using scripts inside FoldingText often crash the program so that you have to force quit it. I don’t know if it’s just my setup or if this is due to the nature FoldingText is written. To replicate the error just use all the reference macros on after another. On my Mac’s after a few tries it start giving me acoustic feedback and error messages. I don’t know when you will come across this post. By the time you read this the GitHub repository might be some months or even years out of date, and, the services might have changed or stopped working. I try to keep everything up to date since this is what I use on a daily basis. But I guess most of you want to be independent anyway and tweak the system to their liking. After all it’s just a starting point. 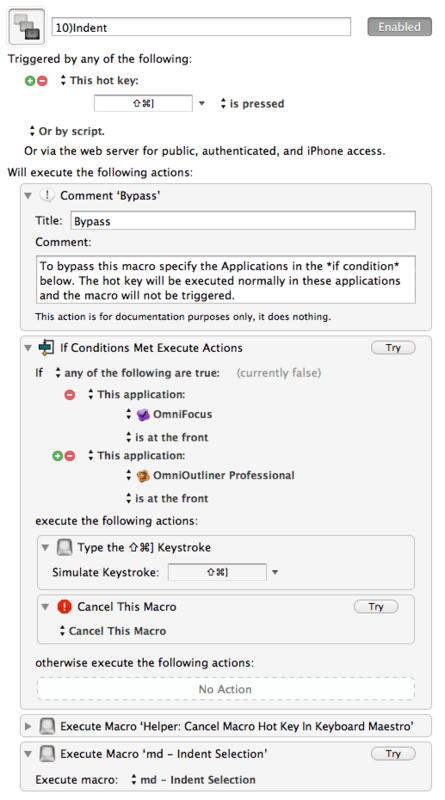 That’s why I’ve deposited the sources of every macro and the macros which use services inside the comment fields at the top of each macro and the according “Execute Macro”. You can always visit the sources, keep track of the excellent people I mentioned here and download the latest version – matter of fact this is what I encourage you to do since they are all great guys with interesting blogs. None of the OS X Services mentioned in this article is hosted on my GitHub. You have to download them from the articles I linked. Jan 21, 2013 FinderPop – more productivity for mouse users A review of one of the oldest Mac apps I know – a contextual menu extension for managing your Mac. Mar 28, 2013 My Mac Setup LINK – My Sweet Mac Setup on Shawn Blanc&apos;s blog. May 16, 2013 Link list – May 16, 2013 Link list post from May 16th, 2013. Feb 27, 2013 Taking Screen Shots And Automating Image Manipulation My setup for taking screen shots and editing images. Jan 05, 2013 Keyboard Maestro as OmniFocus&apos;s Little Helper Here is what my Keyboard Maestro tool belt which helps me handling tasks in OmniFocus looks like.